"The crows maintain that a single crow could destroy the heavens. There is no doubt of that, but it proves nothing against the heavens, for heaven simply means: the impossibility of crows." "The universe gives to those who ask without favor. The electric plug which connects you is desire." "We all want to be famous people, and the moment we want to be something we are no longer free." With Ganymede's Kiss, this compilation features one previously unreleased track, originally composed for a further Sonic Poem release. The Eastgate Music Shop about the CD release "This is the first album compiled by Bianca Froese-Acquaye (Edgar Froese's wife) after the passing of her husband on 20th January 2015. Edgar's music means the world to her -- and especially the tracks of this collection. Out Of This World is one of her ways to honour her husband for his huge life work. She added a very personal 12-page booklet to it and one so far unreleased track by Edgar: Ganymede's Kiss. Of course this small collection can only reflect a tiny part of Edgar's musical legacy, but it definitely spreads a special, sublime atmosphere -- in memory of Edgar Froese and his impressive works." 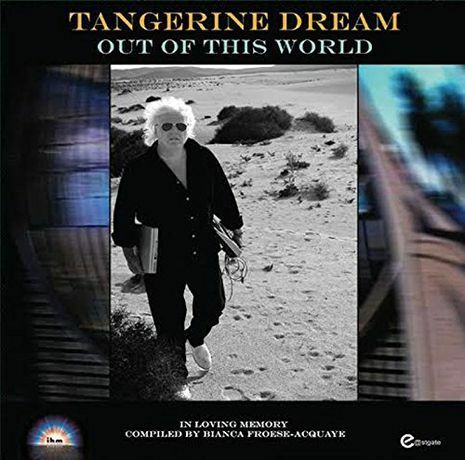 The CD release comes with a 12-page booklet, featuring a number of photos and photo montages of Edgar Froese, some of them with his wife Bianca, several quotations from people who apparently have influenced Edgar Froese in some way or another (including William Blake, Salavador Dali and Franz Kafka amongst others), credits, track listing and both extensive and very personal liner notes by Bianca Froese-Acquaye. All the tracks chosen for this personal album are special to me mainly in the sense as I was present during the process of their creation. For example the two tracks from The Five Atomic Seasons series (Trauma and Oracular World (4th Teaching)) remind me of the period when Edgar was halfway through recovering from a severe illness. His body was still weak, but his mind was so clear and full of energy and he was fortunate that he could start composing again after a long period of abstinence from his keyboards. I can still see him sitting in his studio and smiling very contentedly as if it was yesterday, although he had to go through the musical structures and patterns of his new notes again ana again -- infinite repetitions in the process of composing are inevtable. Each track stands for a special period of time where we shared our life, our sorrows, and our love. I had the privilege of hearing all of his new compositions first and he always asked me what I thought. We could always speak very openly to each other and I never felt shy about telling him my subjective truth which he was very thankful for. Edgar was the type of man who had absolutely no problem accepting an idea or opinion of somebody else when he felt that it was better than his own. He was a very fair character, full of respect and always generous. Now I would like to share these intimate moments with you. Thanks so much, my beloved Edgar, for your wonderful music and that I had the unrepeatable chance to share my life with you. Furthermore, the album was released as double vinyl album in December 2015. The Invisible Hands label about the vinyl release "In memory of Edgar Froese. Edgar Froese was the leader of Tangerine Dream, indispensible pioneers of experimental electronic music and space rock who sold more records than any other German band in history. They recorded more than one hundred studio albums including Zeit, Phaedra, Rubycon, Ricochet and Underwater Sunlight, and a similar number of movie soundtracks including Risky Business, Near Dark, Firestarter, Thief, Sorcerer and Legend. Founder and leader of the band Edgar Froese passed away in Vienna on January 20, 2015. 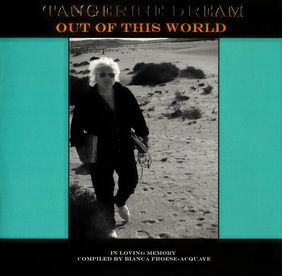 Out Of This World is a compilation put together by his widow, Bianca Froese-Acquaye, and features the music from the band's later work that meant the most to her. Invisible Hands Music are proud to honour the memory of this titan of music by releasing Out Of This World worldwide on special limited edition tangerine coloured double vinyl today."